Harrison Gray Otis (1765-1848) was a lawyer and Federalist.Otis was a U.S. Senator from Massachusetts (1817-1822), and Mayor of Boston (1829-1831). His house is located at the foot of Beacon Hill. This Federalist style mansion was completely restored, with the decor restored to that of a wealthy Boston family of the period. The building was designed by the famous architect Charles Bulfinch. Guided tours are available. The duration of the tour is about 30 minutes. Quoting their brochure, "Discover what daily life was like in Boston after the American Revolution, as the city grew and the neighborhoods changed. In 1796, Harry Otis, a Congressman and entrepreneur, and his wife, Sally, lived and entertained lavishly in this elegantly furnished home. 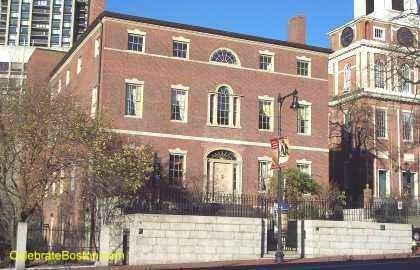 The house became a two-family, then a clinic, later a boarding house, and finally, in 1916, headquarters for the Society for the Preservation of New England Antiquities, now known as Historic New England." Historic New England is a non-profit organization dedicated to the preservation of regional history; both in terms of restoration of buildings and in providing access to researchers of historic material. Visiting the Harrison Gray Otis House supports this noble organization.